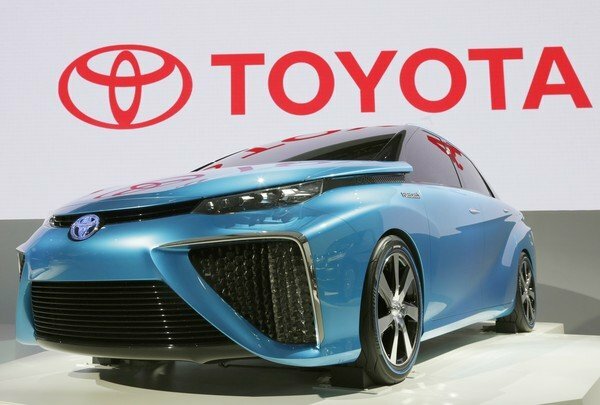 JNN 6 Jan 2014 LAS VEGAS — Toyota unveiled a hydrogen-powered “Car of the Future” that emits only water vapor, at the 2014 International Consumer Electronics Show (CES) in Las Vegas on Monday. Toyota said the prototype would have a driving range of about 300 miles (483 km) and accelerate from zero to 60 miles (96 km) per hour in about 10 seconds. It also would take only three to five minutes to refuel hydrogen tanks. “Hydrogen-powered vehicles will enter our life sooner than many people believe and in much greater numbers than anyone expects,” Bob Carter, Toyota’s U.S. vice president, said in a statement. The car is expected to go on sale in the United States in 2015. California, the car’s initial market, will build 20 new hydrogen fuel stations next year. The number of stations will reach 40 by 2016 and 100 by 2024. Toyota said it had partnered with the University of California Irvine to map out potential locations based on the assumption that owners could reach a refueling station within six minutes. “More information will be released later this year, including a U.S. sales volume target, the name of the vehicle and comprehensive specifications and performance data”, it said. Two months ago, Japan’s Honda and South Korea’s Hyundai also announced they would launch hydrogen-powered vehicles in the United States in 2015. This entry was posted in America, United States and tagged Bob Carter, Car of the Future, hydrogen fuel stations, Hydrogen-powered vehicles, Toyota, University of California Irvine. Bookmark the permalink.